Jailbreak status: Jailbroken using Pwnage Tool. The Goal: Get live on-device XCode debugging without being a paying ADC member. This time OS 3.0 style. Abstract: Same deal as last round. We want to break code signing on the iPhone, and then we want to make Xcode load software into it automatically to debug. In SDK 2.2 (Xcode version 3.1.2) this was just a simple matter of editing some Plists and such to tell Xcode to ignore provisioning profiles. SDK 3.0 (Xcode version 3.1.3) broke these Plist editing tricks. For a while, all you could do was try to hack SDK 3.0 support into Xcode 3.1.2, installed with SDK 2.2. That was really very hairy, though, if you didn’t want to have to switch environments to debug (close and restart Xcode). It was also annoying to configure. Luckily, there’s a new, much less ghetto way. It’s all based on a little hack posted by <zim> in this thread (coral). Essentially, it just replaces a few bits in the Xcode plugin that actually handles the device build, which restores our build and go ability. Procedure: things marked (2.2 STEP) will already be done if you followed my previous procedure, and you may not need to repeat them. Jailbreak your phone. In Cydia, add the source http://iphone.org.hk/apt/. Install the package “Installd Patch” (this used to be Mobileinstallation Patch, just a name change in OS 3.0). Thanks go to @javacom for this lovely little hack, and lots of other wonderful info on his blog. Seriously, if you’re reading this right now, you should be following him. UPDATE 8/3/09: Some are reporting that if you’re on OS 3.0.1 or possibly a 3GS (or both) Installd Patch may or may not actually install. If this is the case, or if you get weird message about your identity being no longer valid, try installing AppSync as a stand-in. (2.2 STEP) You will need a signing identity. We’ll break the check such that it doesn’t have to be an official ADC one, so you can make your own using this guide from apple (coral). What you are doing in this step is creating a “Self-Signing Identity.” Note that you should name the identity “iPhone Developer” EXACTLY to avoid having to change a bunch of the steps below. (2.2 STEP) Open your project and go to (menu) Project > Edit Project Settings. In the list of properties, find “Code Signing Identity” > “Any iPhone OS Device” and click in the empty box. Assuming there are no entries in the menu, click “Other” and type in the same name you used to generate the code signing certificate above in step (2). For example: in step 2, I used the name “iPhone Developer” and that is exactly what I put in this field. Hit OK and close that settings window. This setting should persist in future projects, and you shouldn’t have to do this again. tap i on your keyboard (to enter “insert” mode in vi). type ESC, then : x (colon,x) (enter). This saves and exits in vi. type ./script (enter) This will execute the script to patch the Xcode plugin. Assuming it completes correctly, you should be good to go, try it out! NOTE: You will have to repeat this step for every project! (That is, the add build phase part, not the terminal part.) It’s a bummer, but I’m not sure there’s any way around it. I’ll try to figure out if you can persist custom build phases across projects. Note: You may notice that a number of the steps you remembered from last time are gone now. I believe the few-byte hack above takes care of all the steps. As far as I know, there’s no need to even modify your projects with that one Plist key, everything just works. I currently have this setup working on my production machine, but just to be sure, I’m going to boot up my external disk and I’m going to test this procedure start to finish. As usual, don’t hesitate to comment if you have questions or run into trouble, and I’ll do my best to help. Special thanks regarding the last step to zim at iPhone Dev SDK forums and to Sylvain Munaut, whose script gen_entitlements.py is used above. You need to do step 2 under “procedure” perhaps with ‘developer’ lower-case. “The identity used to sign the executable is no longer valid. Obviously, I checked and all seems to be in order. I rebooted both devices, cleaned the build, still having the same problem. Any thoughts? Is the difference critical? and what is the correct one of XCode 3.1.4? The difference IS critical, since it has to do with the location of the appropriate bits to patch and that changes from xcode 3.1.4 to 3.2.1. This thread should be correct for 3.1.4. If it’s saying the identity is no longer valid, your best bet is to either check that it’s definitely NOT out of validitiy (keep in mind you can set the START valid date too, maybe it was accidentally set to something in the future and not right when you created it?) and failing that try restarting everything. 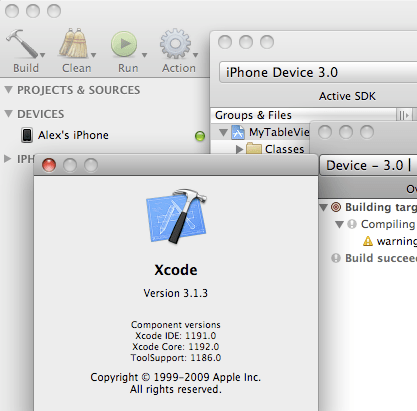 I have XCode 3.1.4 and Developing for 3.2.1.
oops, i mean that xcode crashes. after i switch from simulator to device, and as soon as i do anything else after that. I’ve got 10.5.8 and Xcode 3.1.4 and have the same issue: Xcode just crashed after switching from Sim to Device. Man, I’m glad to see others with this problem. A couple of times I was able to get it to work by completely removing Xcode and reinstalling, but the problem comes back. When I was a Windows guy I had some utilities I could use to track down problems but I’ve only been using a Mac (actually a Hackintosh) for about a year so don’t know how to go about finding the problem. I hope someone can solve it soon. The first project I have tried this, it worked perfectly. Please verify that your device's clock is properly set, and that your signing certificate is not expired. I am using xCode 3.2.1 and this is regardless of any SDK that I compile under (although the person who wrote the code wrote compiled it with 2.2.1) . In my particular case, someone else has built this code for me on their system using the keychain name “iPhone Developer”, so one would think these steps would be perfect. However: when I generate a new key I cannot get a trusted key to reside as “iPhone Developer”,it says “this root certificate is not trusted” – I have generated the key several times all with the same result. wow, it did work!! really. Well for all the people asking, it ONLY works for the SDK 3.0 with XCode 3.1.3, this is the download link from apple http://developer.apple.com/iphone/download.action?path=/iphone/iphone_sdk_3.0__final/iphone_sdk_3.0__leopard__9m2736__final.dmg the only limitation is that you can only make apps for OS 3.0 or lower (it works for me because I am learning) the only thing and I dont know why is that I dont have to apply the last script for project. For me, I tried getting this to work on xCode 3.1.4, whereas I think this hack only works to ver 3.1.3. I saw a slightly different output when running the patch script, but thought hey lets see what happens. Easiest way to back out the changes is to rename the “iPhoneOS Build System Support.original” back to “iPhoneOS Build System Support” which replaces the patched version with the original. easier than reinstalling the whole SDK, right? \xc3\x26\x00\x00 instead of \x8f\x2a\x00\x00 in the script does the trick for device debugging for me. Does this work for xcode 3.2.3? does this work for iOS 4.1 SDK? After I executed all steps, I can get the result and run the program on my iphone4. But, how to pack the program as a ipa format?